12" CPVC Rain Cap A | U.S. Plastic Corp. 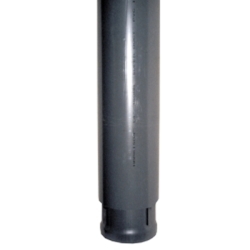 These corrosion-proof 12" CPVC Rain Caps are for the construction of exhaust ventilation systems. CPVC material compounds used in the manufacture of these duct fittings conform to Type VI, Grade 1 CPVC, Cell Class 23447 as described in ASTM D-1784. Style B rain caps are designed to provide zero pressure loss. Basically there is nothing in the way to obstruct the flow of air thru the cap while still preventing rain and snow from entering the system. Overall dimensions are 14" diameter and 58.5" long. Socket depth is 2.5". Maximum service temperature is 200°F. NOTES: Fittings are triple bead welded. Pictures are to represent style of fittings only; actual color is light gray.